Key West is an island at the very southernmost point of the state of Florida that serves regularly as a port of call or an initial starting point for many Western Caribbean cruises. Given the fact that unlike most stops that guests will encounter along their journeys, Key West has the unique distinction of being located in the United States and therefore for English speaking passengers, there are fewer issues with language barriers and confusion with traffic signs and patterns. A such, cruises to Key West affords visitors a little more flexibility in terms of exploring the local area due to its compact size, laid back atmosphere and ease of getting around and communicating. Many activities and excursions can be found very near all of the three Key West cruise port stops in the area, but with the area known for nightlife and booze tours, it can be challenging for people traveling with small children or those aboard family cruises to find activities and excursions to do that are appropriate. Luckily, we put together a list of the best five activities for families in the Key West Cruise Port area to make finding something to do in this island paradise a breeze. 1. The Conch Train: For adults traveling solo, the Conch Train may seem like a cheesy way to spin through old Key West; but for children, the open air, kitschy tourist hauler is a perfect way to explore the historic part of the city. Guests are treated to a tour lasting over an hour of the most interesting historic spots in Key West including the Hemingway House, Duval Street and the lighthouse. 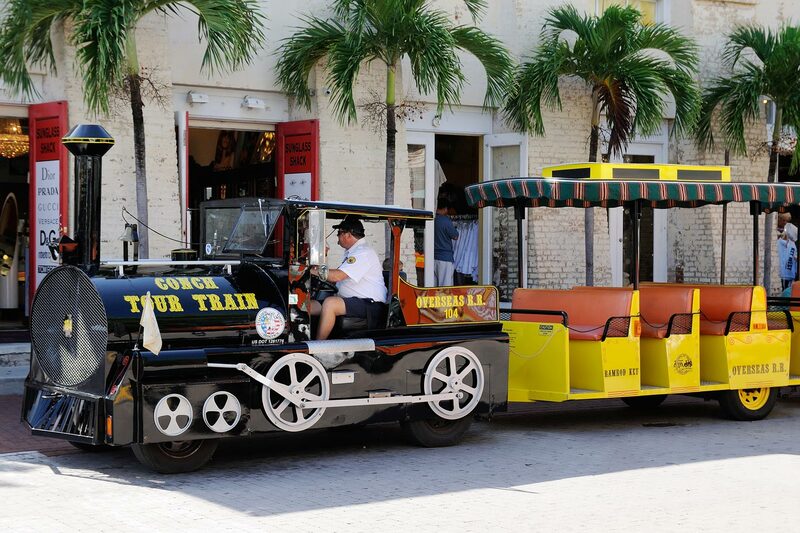 There is an off and on feature offered by the Conch Train, so visitors who want to hop off and explore on their own some of the shops and eateries in the area before heading back to the Key West cruise port can and then get scooped back up by the train sometime after. The train also treats guests to delightful displays of local landscaping and tropical foliage for an interesting outdoor experience with educational and historical value too. City tours are common for guests aboard Western Caribbean cruises, but the Conch Train is particularly well liked among children who find it is a speedier and bumpier ride. 2. Shipwreck Museum: Little travelers may not be quite ready for snorkeling adventures to see shipwrecks in the murky sea, but they can certainly have quite a bit of fun checking them out on dry land! Not far from the Key West cruise port can be found the shipwreck museum, a graveyard of artifacts recovered from shipwrecks as well as an immense amount of history to go along with them. Visitors here can learn about the importance of Key West and how and why it was once the richest city in America. Through stories and acting and real recovered objects, the interactive experience is a treat for guests both young and old. 3. Key West Aquarium: One of the best Key West attractions for little ones is actually no more than a convenient and pleasant walk from the Key West cruise port. The aquarium here boasts colorful displays of a wide variety of sea life including jellyfish, eels, many fish, seahorses, and of course, sharks. This not a large aquarium perfect for guests looking for an activity that is around an hour long. However, while the tour is rather short, there is no shortage of beautiful living displays to admire. The Key West aquarium focuses heavily on conservation, and guests will no doubt enjoy learning more about the creatures they are viewing and how to protect their environments. 4. Butterfly and Nature Conservatory: Although the life in the water surely captures the spotlight in Key West, there are also some beautiful land bound critters that are more than worth checking out. The Butterfly and Nature Conservatory boasts a greenhouse full of the fluttering, whimsical floaters and children delight in an opportunity to see them up close and personal. The conservatory is close to the Key West cruise port (within walking distance) and is relatively inexpensive compared to some other activities in the area. There is also a gift shop on site for visitors to take home a souvenir to memorialize their jaunt with the butterflies. 5. Glass Bottom Boat Excursion: Age is just a number when aboard a glass bottom boat, as guests both young and old are certain to be captivated by the amazing views they are afforded while looking down on an active community of sea life just below their feet. Although much further from the Key West cruise port than many other activities (in fact, a ride out to the reef is in order) guests do not mind the journey when the end result is a visual sampling of the snorkeling experience without setting a foot in the water. It is a fantastic experience for guests of all ages, and worth leaving the Key West cruise port for!